I have risen momentarily from my blog-writing slumber to let everyone know about a wonderful new documentary project by producer/director Camilo Silva called After 68 that’s currently in the works on what is perhaps the single greatest loss of history to ever befall Los Angeles – the demolition of the Ambassador Hotel in 2005. If you think I’m being overly dramatic just take a look at the scope of the history of this astounding place. We really lost something here, something that ran way deeper than the loss of a mere building. So many events, so many people, so much that made Hollywood and Los Angeles and beyond, centered around the Ambassador. It was part of the very soul of Los Angeles. It didn’t just witness history. It made history. Now its gone and we can never get it back. That’s why I am so happy to see this documentary being done on the Ambassador, its rise and tragic fall and from what I’ve seen it looks like its going to be great. I can’t wait to see it finished. Please check out the trailer here and please help make After 68 a reality by contributing to its completion funds if you can. The goal is within sight. Every dollar helps. We owe it to the Ambassador, to Los Angeles and to ourselves to make sure this story is told. We can never replace this treasured landmark, but we might be able to learn something from it. The Ambassador can be our Penn Station, a tipping point in the battle for historic preservation that ultimately saved so many other Manhattan landmarks from the same ignoble fate. Will it become a rallying cry of “never again,” never again allow something so critical to our history to be taken from us without at least one hell of a fight? I hope so. Here’s the full press release on After 68 and its related links. After 68 examines historic preservation through the lens of the 15-year struggle to save the Ambassador Hotel from the wrecking ball. For decades the Ambassador was the epicenter of cultural and civic life in the U.S., playing host to the Academy Awards, celebrities, international dignitaries, iconic authors, artists, scientists and every U.S. President from Hoover to Nixon. The hotel’s legendary Cocoanut Grove was one of the most sought after music venues in the world, showcasing almost every major musical act of the 20th century and launching the careers of countless stars. In 1968 the Ambassador’s fate took a dark turn when it became the site of a tragedy: the assassination of Robert F. Kennedy. When the hotel closed in 1989, the Ambassador once again garnered national headlines during a dramatic battle between preservationists and the school district over the fate of the site. A heated fight ensued, quickly polarizing the community and sparking a multifaceted debate that pitted education against historic preservation. After a lengthy and costly legal battle, the board voted to demolish the hotel. “California doesn’t preserve much of their history…Tear it down and build something new, there was no interest in the preservation of it” stated Merv Griffin in his After 68 interview. Coming in at just under $600 million, the new school campus that was constructed would end up with the distinction of being the most expensive school built in U.S. history. In the first feature film ever to turn the lens back on the Ambassador, Silva weaves together classic photography and historical footage, along with captured footage of the building’s demolition, and emotional interviews from a range of key people involved with the hotel. “As documentarians timing is critical for us because with every day that passes we are threatened with losing the oral histories that only remain within our collective memory and we want to recover them before it is too late,” says Silva. 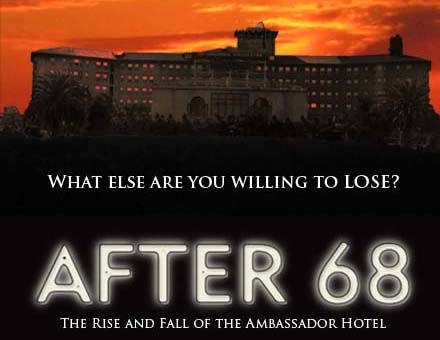 Using first-hand accounts, After 68 demonstrates how the Ambassador Hotel’s rich history ultimately placed it between opposing cultural divides: a pawn in the power struggle between those who saw the importance of preserving our past as a means to define our future, and those who were willing to destroy it. “The Ambassador’s story marks the irrecoverable loss of an important relic of human and social history, and as filmmakers we want to educate the public about the value of protecting our past, and thereby ensure that the other Ambassadors of the world may be saved” declares Silva. This film is not only a tribute to the life and legacy of the hotel but it will also serve as an important symbol for the value of historic preservation worldwide. This entry was posted in General Announcements, Lost Hollywood, Mid City and tagged 3400 Wilshire Boulevard, After 68, Ambassador Hotel, Camilo Silva, Myron Hunt. Bookmark the permalink.